Getting the services of a professional fishing tour company, specially a professional guide can improve the odds of landing the perfect catch and add to the overall enjoyment of a fishing trip. With its extensive coast-line and numerous reservoirs and lakes, Sri Lanka is an excellent location to participate in, and enjoy the exciting sport of inland and deep sea fishing. Inland fishing can be arranged at any time of the year due to the relatively smooth flow of water on inland waterways and reservoirs located around Sri Lanka. However, as with all sea-based activities, deep sea fishing in Sri Lanka is also seasonal , with the Western and Southern coasts accessible from November to April and the East coast more suitable for the activity from May to September. You have the option of fishing from the beach itself or venture out to sea in an in-built or out-board fibre-glass motor boat to try your hand at troll fishing. Safety equipment such as jackets as well as rods and bait, and other equipment will be supplied by us . Fishing expeditions can be arranged as day tours or as part of a longer itinerary. 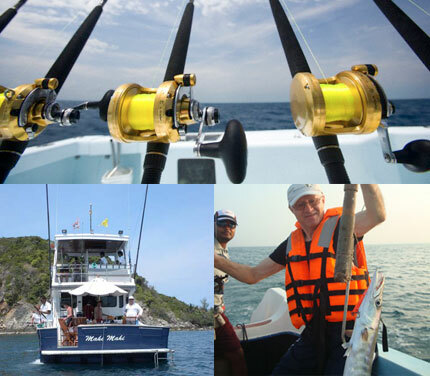 Hire of complete Sport Fishing Equipment. Lunch / accommodation / Transport could be arranged on request.